MOAB — After paleontologists discovered a giant mass of dinosaur bones in 2004, scientists unearthed a 9 ton sandstone rock in late 2014, marking the first site ever to hold a giant collection of complete dinosaur skeletons trapped in quicksand. 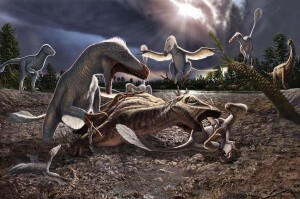 Their pristine preservation, which includes a minimum of six Utahraptors, has led researchers to new questions concerning these prehistoric meat-eaters as well as offering additional evidence into current theories surrounding Utah’s dinosaurs. Depicted as feathered, sharp-toothed, predators, with dagger claws – used for killing prey – extending from the second toe on each hind foot, the Utahraptor is the Arnold Schwarzenegger of Jurassic Park’s dino-star, the Velociraptor, and existed during the cretaceous period some 125 million years ago. Equipped with four wings, the Utahraptor is known as a flightless proto-bird sort of like an ostrich, said Utah State Paleontologist James Kirkland, who led the decade-long excavation effort to uncover and remove the mass. 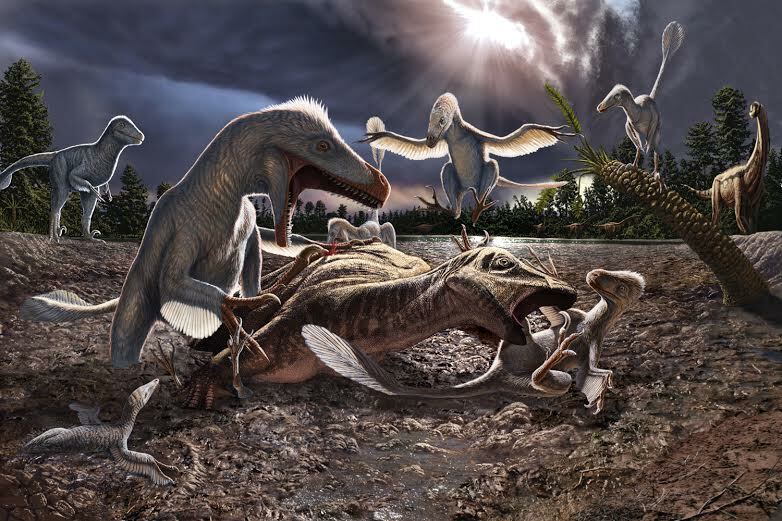 The feathers were used as a mechanism for added lift, but not used to the extent of soaring like flying squirrels, as the full-sized Utahraptor tipped the scale a few hundred pounds shy of 1,000 and boasted a skull measuring almost two feet long. 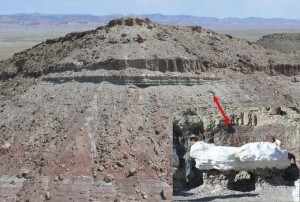 The discovery of the site was initiated by an accidental find in 2001, when a University of Utah student was studying the rocks near an 800 foot mesa on the east side of Arches National Park as part of a geological research project. The bone was reported as being hollow which indicates a meat-eater. 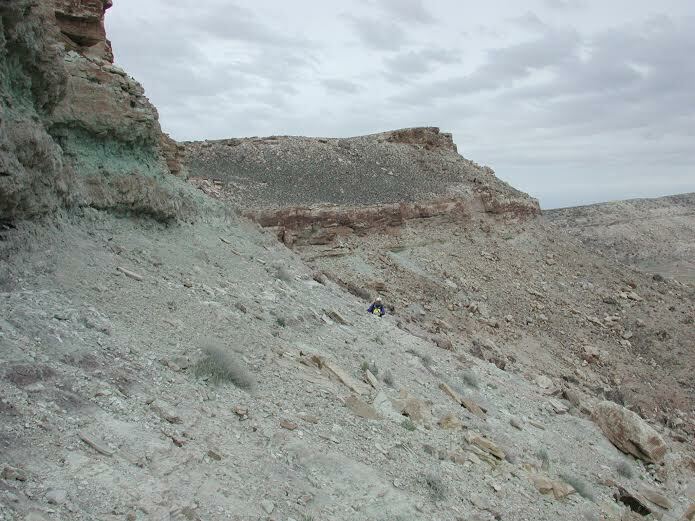 Kirkland, along with a few other researchers, went to the site where the bone was seen and spent hours roaming the land in search of dinosaur bones. Over time, the sun bleaches bones white, and up against the white rock, the bones were nearly camouflaged. 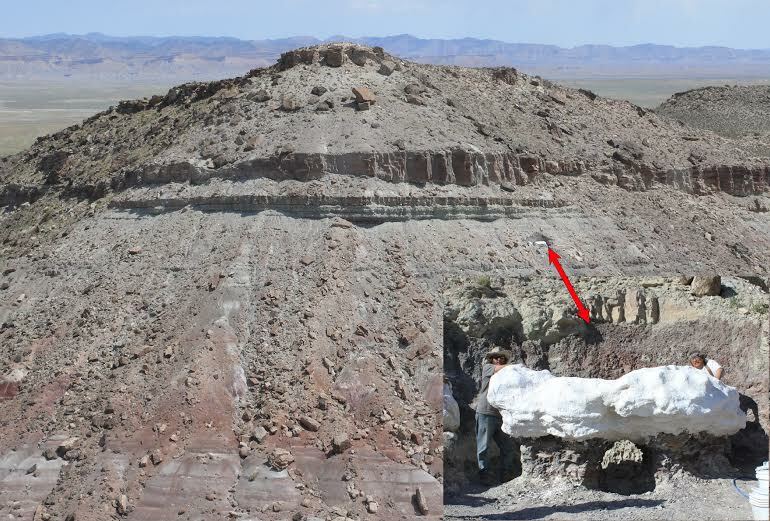 Scientists were almost ready to give up, after hours of searching, when a piece of rock split open and revealed a Utahraptor jaw bone. Over more than 10 years, Kirkland led the excavation of the site. As they worked the ground, scientists unveiled an unusual discovery. The bones were tightly fit together so that they were unable to be removed from the mass. 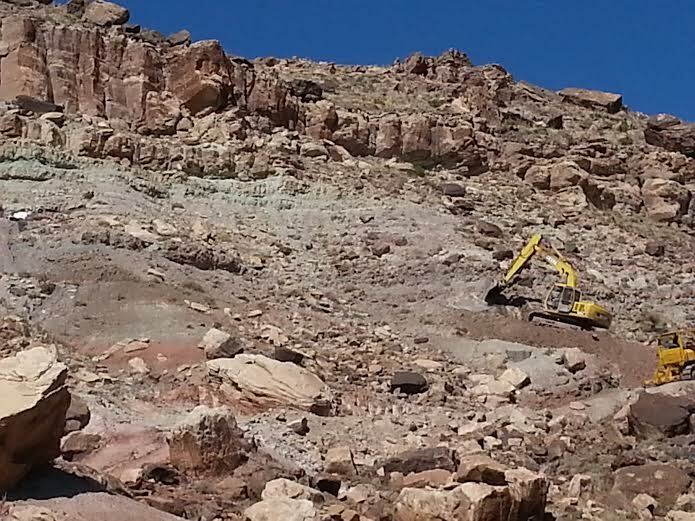 In order to remove this approximately 18,200 pound block, Kirkland thought the only option of getting it off the steep slope of the mesa was by way of helicopter. 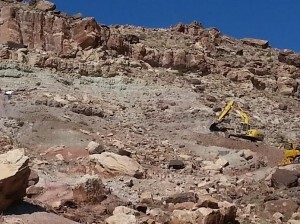 While that option proved too expensive, the team worked by means of shovels, excavation equipment, and a lot of up and down climbing. 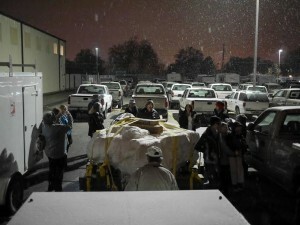 A frame was engineered and the mass was finally transported on a semi-trailer. 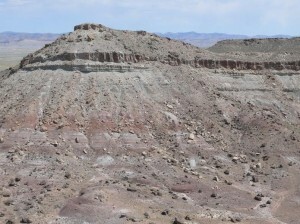 The giant mass is encased in sandstone and red mudstone. 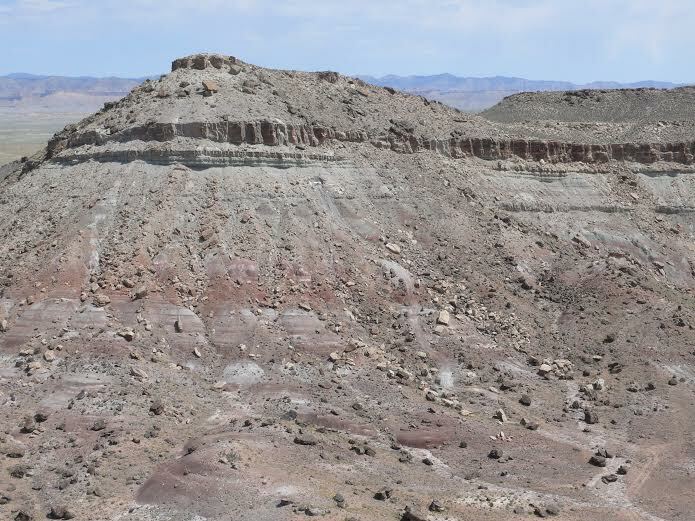 During the cretaceous period, a series of lakes surrounded this area, Kirkland said. As the lake drained, the ground would have become saturated and a water escape structure would have been produced, more commonly known as quicksand. The fact that the quicksand encases the bones begs the question — what happened? Among the raptor skeletons, scientists also found the beaked bipedal herbivore called an Iguanodont, sort of the prehistoric cow. 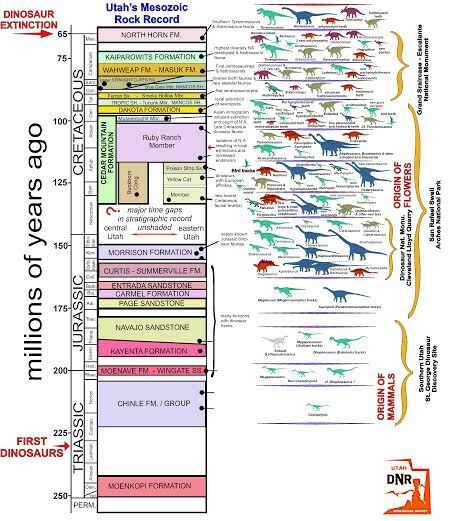 The inclusion of the Iguanodont points to possible theories surrounding the group death. “The raptors could have been chasing the stench where an Iguanodont got stuck in the quicksand,” Kirkland said. By studying the bones, researchers may be able to identify whether the dinosaurs stuck in the mass all died at once or at different times. If they did die together, this could be further evidence that the raptors did hunt in packs as depicted in Jurassic Park. There is also much to be studied in the physical makeup of the Utahraptor. Every tooth is intact in the jaws of the Utahraptors, which range from a 3-inch baby skull to the adult-sized, Kirkland said, and the variance of ages offers a way to study the growth patterns and age of sexual maturity. Researchers also hope to find traces of a feather. Kirkland and his team are in the final stages of negotiations with Thanksgiving Point in Lehi, where researchers hope to work in front of the public as they analyze the bones and test theories in hopes of reconstructing a more precise story of Utah’s past. 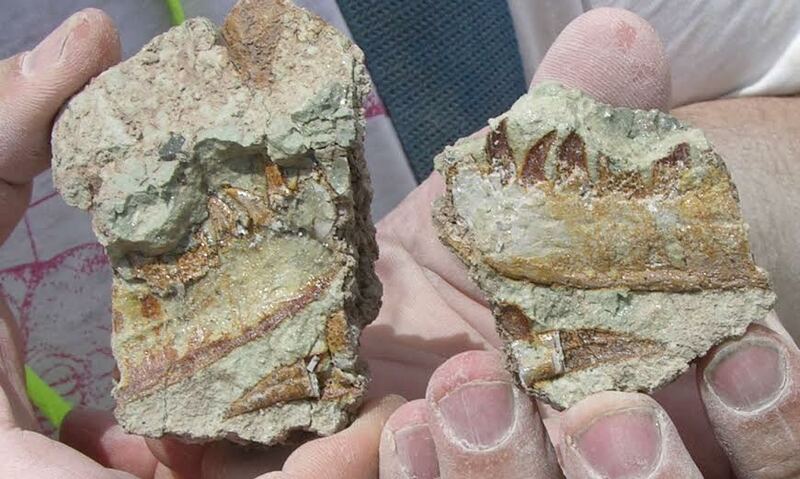 MAYBE ONE DAY THEY FIND ORRIN HATCH’S DADDY IN THESE FOSSILS. How would anyone know if something is 3,000 years old or 100 million years old or 124 million years old or 125 million years old? Science. Because half-life transitions of several unstable (radioactive) elements to secondary elements are known and can be predicted based on ratios of each in any given sample containing them. Calculations are then made to determine the age of the rock. Also, in general, ongoing rock formation we see today are the same processes that happened eons ago; it takes time, lots of it. Your skepticism is great, the hallmark of a scientific mind. Seek validation through compelling evidence. Question, learn, explore. Now apply it to all areas of your life, sparing none from scrutiny. Jeremy, that is how to answer a question. Thank you. A lot of folks would, do and did reply with worthless diatribe. I learned something I did not know. It has to do with the breaking down of a certain carbon molecule. Goodness gracious don’t they teach science in school anymore? Oh ya the teach science, I’m the creation believer, not evolution.its God they kicked out of school, not science. Actually, I should have said creator. I don’t believe in “evolution” i dont believe we came from monkeys. but I do believe science is fascinating, especially the development of DNA profiling. Isn’t the earth only 6000 years old? Or if you are blinded by religion. Awesome article. I love the art piece by Julius Csotonyi.